Last week, I took the MRT and it was quite packed. I am a senior citizen and I had hoped that someone would be kind enough to offer me a seat, as has happened before. But not this time. I was standing in front of a younger lady who was seated on the priority seat and busily engaged with her smartphone. I tried to make eye contact with her but chose not to verbally request for the seat. I took the opportunity to do a personal experiment. She looked up at me momentarily, but quickly returned to her smartphone. At the City Hall MRT, we both alighted. I gave way to her as she made her exit and I followed. Quickening my steps, I caught up with her, smiled and said, “Good morning. May I ask you a couple of questions?” She returned a smile and said, “Sure.” I asked her if she would give up her seat to someone in greater need, like a senior citizen. And she replied, “Of course, I would.” I then gently announced that I was the Senior Citizen standing in front of her. In obvious shock and embarrassment, she said, “I am so sorry!!! You do not look like a senior citizen. If I had known, I would have gladly invited you to take my seat. I am really really sorry.” Her sincerity was fully evident in her profuse apologies. I smiled and said, “Thank you, that is what they all say about me. No worries.” I then asked her if she would give up the seat for me if I had requested for it. “Of course,” she said. “ I would have... without any hesitation.” And she continued apologizing. I thanked her for her responses and we walked together towards our offices. We’ve read or watched Stomp videos of situations similar to what the younger lady and I were in, and those didn’t go well. If I had curtly demanded the seat, I would have either made her lose face totally, or worse, possibly triggered a defensive-aggressive response. 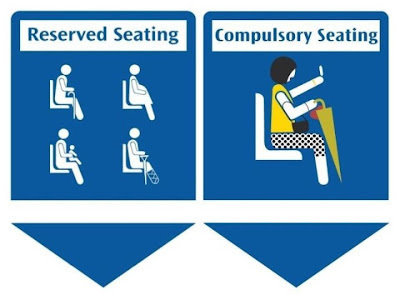 So while we might be well in our place to expect the priority seat to be given up for us who are identified as needing it more, we can also ask nicely and without prejudging the person occupying the seat. My experience reinforced what I believe about our people. We are essentially kind. People do not act graciously because they do not know or are too caught up in their busyness to be aware of the need. If they knew, they would respond. This is why we keep reminding people and we know that many are responding. We need not prejudge, we can do our part by assuming the best of people. Chances are, people will respond according to what we think of them. Kindness is all about being other-centered. It is a value that should be inside us. But to look out for or not prejudge others, we need to consciously make an outward effort and take some time. And that only takes a moment. That’s why we say, there’s always time to make someone’s day. This whole "kindness movement" is a joke. It's tragic we actually have to have a movement to get people to be kind. Pathetic. ya, cause they are not kind enough. like you by making this comment. Good article! Clear that the nature of things needs to change and education remains a crucial step in leading this change. I wonder though if Singaporeans will ever learn to gently confront situations they are uncomfortable with. The way it seems to work presently is allow the discomfort to boil within and then, the only discourse possible becomes an emotionally charged often unnecessarily intense exchange. well said. it's the unspoken expectations and "internal dialogue" that makes people so worked up. when we are able to vocalise our needs without the cloud of prejudice, things will be much better. i do agree that it's sad that we need a body like the kindness movement to teach us to be nice to other people. but one might argue that it's because of people like you, @jacky, that a kindness movement is necessary. this fella is just doing his job, and you can't even be gracious about it. i contend, sir, that it is you who are pathethic. Thumbs up for Professor Wan. Good job with your Kindness Movement, reminding people to be kind among their hectic life styles. Jacky, it's a pity that you do not realize how negative your comment is. It serves no good in saying something which does no good. You jokers are going on and on about kindness, but have to hide your names because you're just ashamed of yourselves and your comments. Self-righteous hypocrites. If you truly are so noble, shut up, get out of your comfort zone (I'm referring to your air-conditioned room and cushioned chair) and try to make some tangible difference to people's lives. This whole affair is a tragedy. And this is but evidence that we're all sinking into the cesspit of depravity. HAHA the joke is OBVIOUSLY on you. Jacky, if you are sincerely interested to know what I have done outside the comfort zone, I would be glad to meet you in person. and if you are making a tangible difference to people's life (for the better, I assume) I would like to know more and learn from you. Have a good weekend all – that’s a good time to make someone’s day! the author of this blog did exactly that. not only does he represent the kindness movement, he's also gone out and done something about it and subsequently, blogged about it. the same author, movement and blog post that you've labeled "pathetic". i can't say i've done what he has, but i support the work he, and other like him, do (from my comfortable air conditioned room and cushioned chair) with words of encouragement. if there's evidence of anything at all, it's how tragically comedic your retort is. self-righteous hypocrite? wow. talk about shooting yourself in the foot. well, it's been fun, but i'm afraid your depraved logic might be infectious. i'm sure you'll have no problems carrying on this conversation... with yourself. good luck with that thing you call a life. What's ironic here is that the blogger has shown a kind act, yet the comments here are so unkind. Jacky should be allowed to say what he wants, and it's obvious to anyone who reads what he says is that his comments is already the best argument as to why there needs to be a kindness movement. In any case, the kindness movement is not unique to Singapore ... many countries have organisations promoting kindness. There are at least 20 kindness movements in the world that we know of - Australia, Brazil, Canada, France, India, Italy, Japan, Nepal, New Zealand, Nigeria, Oman, Scotland, South Korea, United arab Emirates, United Kingdom and the USA - just to name a few. Are all these countries pathetic as well? 1. You gave the young girl a chance to reflect on her actions in a place where she would not be embarrassed in front of others. Embarrassment of another has been equated to killing another for the sensation of terror and heat that rises inside the person who has been embarrassed. I see too many who discipline their employees or children in a public setting causing severe embarrassment which I believe diminishes the intended effect of the reprimand and causes discomfort to all who witness it. Kudos to you for kindly helping the girl to retain some dignity. 2. Often when we feel we have in some way been wronged by another we keep it inside and let it build until one day we can no longer contain it and explode in a fit of anger. By calming telling the young woman of you status as a senior citizen, which I'll admit is difficult to discern from your appearance, and of your desire for the seat you were kind to yourself. You relieved your angst over the situation in an appropriate fashion and no one else had to be at the surprised end of your frustration not being aware of what you had just experienced. One final item. Many times the young or the unaware slight the elderly or pregnant or infirm on public transit and the slighted individual or the other riders don't speak up. By not pointing out, kindly, the situation to the youngster the behavior won't change. A kind suggestion to the individual that 'it would be most helpful and kind if you would please give your seat to this senior/pregnant/infirm rider amongst us' would likely be met with a positive result giving all the opportunity to feel good and learn the kind rules of the transit system. In kindness, your friend in Colorado. Thanks, Dafna. Great to hear from you. Your observed moments of kindness are right on. I choose to believe in the best of people and give others the benefit of doubt. Kindness is in all of us. Kindness breeds kindness, and we are not about to give in to negativity and cynicism. Positivity trumps negativity any time! First and foremost, addressing social issues (on a national or worse, a global scale) is not a simple task. Instead of being adamant to such positive programs and activities that will eventually bring good to our society, we should instead embrace them with open arms and support whatever social changes and improvements we can bring about in our community and at the national level. I’m proud to be Singaporean and I believe in what the Singapore Kindness Movement does for us all. We live in an urbanized society and a globalized world where time is scarce and work’s aplenty. There’s so much to be done with so little time that we get so self-centred and absorbed with our daily activities and we fail to realize that there’s more to life than just us. I guess, we need a reminder once-in-a-while (from the Kindness Movement or any other society for that matter) to express our sense of humanity, the purpose we are built for to be loved and show love to others. I stand by the belief that Kindness Education is important and the work of this movement is crucial for the country's nation building and future of our young. To put into perspective, if there is a need for formalized education, there surely should be present, some form of "heart-ware" education about being gracious and kind to people which our young and ourselves can learn about. Since we all have hectic lifestyles as working adults often working more than 40 hours a week, we sometimes forget to “transfer” life’s important lessons like respecting elders or saying ‘thank you’ when someone does something for you, to our children. Mannerism is a virtue, and of course, the kindness movement is doing us all a favour, constantly reminding us that we can do much (for others) in the little spare time that we have. I guess the only thing left to do now is to make the first move and not sit on our laurels; we’ve got nothing to lose by being kind... think about it! Indeed, Farhan, "kinds words do not cost much, yet they accomplish much," according to the Rene Pascal, the French scientist. I've had the opportunity to travel across Java (in Indonesia) many times over the years and have found the locals to be exceptionally kind towards senior foreigners. I was in a very crowded non-airconditioned bus moving towards a not so prominent town in Central Java (Jateng, as the locals call it). I was amazed that these locals (mostly farmers) are quick and responsive to offer me their seat, and this small act of kindness from a less developed country really put some of our insensitive and arrogant young, educated Singaporeans to shame. If only more people could think of both sides of the situation. There was once where I was stared at, given the dirty eye, had my photo taken and eventually confronted for not giving up my seat because I had not seen an older person as the train was too crowded and of course I was using my smartphone. The elderly wasn't the one that did all of the above but another lady in her 30s. Best part of it was, I was no where near the reserved seat - I was in the CENTER of the row. I guess because I look younger? So naturally I face this type of "discrimination" on the train. I have given up my seat many times even if I'm not on the reserve seat. But this is too much. The campaign can be said to be TOO successful IMO. Hi, i was once in a situation of being told off by a uncle and aunty for not giving up my seat (i was sitting beside the reserved seat) . it happened like this. when i boarded the train, there wasnt much people so i sat the seta beside the reserved seat and my sister was on the reserved seat. however, as the train travel, there are more and more people coming in. while playing on my smartphone, i kept a lookout for elderly. at one of the stops, there was an elderly coming in. i really didnt notice it. i only notice it when a lady beside me giving up her seat when the elderly just came in (the train have not started to move yet). so i thought to myself that i need not give up my seat since the elderly has an seat. after that, the aunty and uncle (the elderly mentioned earlier) started to told my sister off and exchanging conv saying me and my sister wasnt educated etcetc. i knew they were talking abt us and i choose to ignored. i knew that we should gave our seats up especially the reserved seats. however, i dont get it why some people judge so quickly and assumed that we didnt want to give our seats up. when i alight, i even apologised to the uncle for my sister behaviour as they almost broke up a quarrel. i just wanted to share what i experienced, not harm. Hi, i was once in a situation of being told off by a uncle and aunty for not giving up my seat (i was sitting beside the reserved seat) . it happened like this. when i boarded the train, there wasnt much people so i sat the seta beside the reserved seat and my sister was on the reserved seat. however, as the train travel, there are more and more people coming in. while playing on my smartphone, i kept a lookout for elderly. at one of the stops, there was an elderly coming in. i really didnt notice it. i only notice it when a lady beside me giving up her seat when the elderly just came in (the train have not started to move yet). so i thought to myself that i need not give up my seat since the elderly has an seat. after that, the aunty and uncle (the elderly mentioned earlier) started to told my sister off and exchanging conv saying me and my sister wasnt educated etcetc. i knew they were talking abt us and i choose to ignored. i knew that we should gave our seats up especially the reserved seats. however, i dont get it why some people judge so quickly and assumed that we didnt want to give our seats up. when i alight, i even apologised to the uncle for my sister behaviour as they almost broke up a quarrel. i just wanted to share what i experienced, not harm.Hi, i was once in a situation of being told off by a uncle and aunty for not giving up my seat (i was sitting beside the reserved seat) . it happened like this. when i boarded the train, there wasnt much people so i sat the seta beside the reserved seat and my sister was on the reserved seat. however, as the train travel, there are more and more people coming in. while playing on my smartphone, i kept a lookout for elderly. at one of the stops, there was an elderly coming in. i really didnt notice it. i only notice it when a lady beside me giving up her seat when the elderly just came in (the train have not started to move yet). so i thought to myself that i need not give up my seat since the elderly has an seat. after that, the aunty and uncle (the elderly mentioned earlier) started to told my sister off and exchanging conv saying me and my sister wasnt educated etcetc and the aunty tried to take pic of my sister.i knew they were talking abt us and i choose to ignored. i knew that we should gave our seats up especially the reserved seats. however, i dont get it why some people judge so quickly and assumed that we didnt want to give our seats up. when i alight, i even apologised to the uncle for my sister behaviour as they almost broke up a quarrel. just to add on, i had gave up my seats on several occasions. i just wanted to share what i experienced, not harm. sometimes, i also wondered, why does people who doesnt give up their seats get stomp or being told off(for bad) while people who gave up their seats doesnt get stomp or being praised(for good).